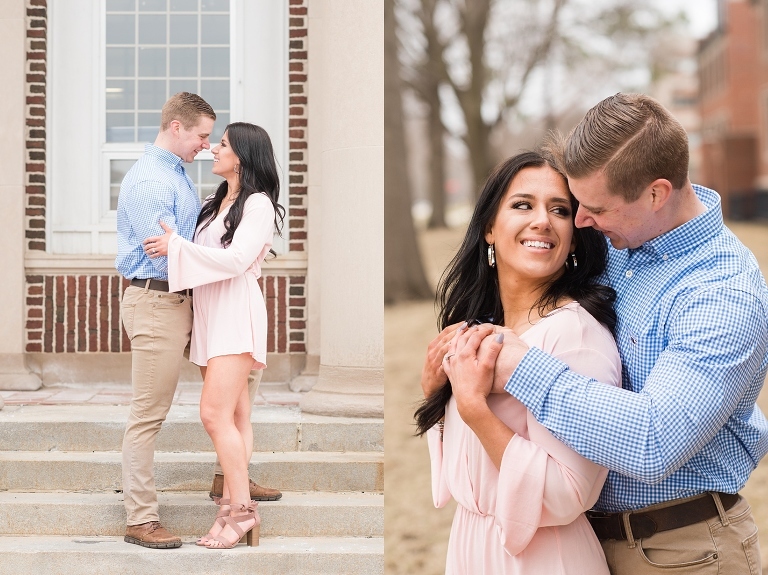 When Christina & Brandon let me know they were really up for anything for their engagement session, but that they had a small window of time to get their session on the calendar due to Brandon’s schedule, I was so SO thankful that we happened to have a spring day WITHOUT snow. You’d think that would be easy to come by for April, but this year has been anything but normal when it comes to weather! We have had several snow storms in March and April that really messed things up for a lot of us, and while this day was anything but warm (I think it was barely 50 degrees?) at LEAST it wasn’t snowing! LOL! While we didn’t have the same beautiful flowering trees we would have had a year ago, we survived with a gorgeous day for portraits around a few places in Grinnell that I’ve grown to love. Christina and Brandon are incredibly sweet and sat on squishy damp grass so I could take some tall grass photos – not everyone will say yes to that, but they did! Thanks for trusting me! About halfway through our session, I noticed that Christina was bleeding – on her ring finger, of all places! We made it work, though! And a little photoshop magic on a few images made it worth skipping a bandaid for those few photos where it was noticeable. Christina &. 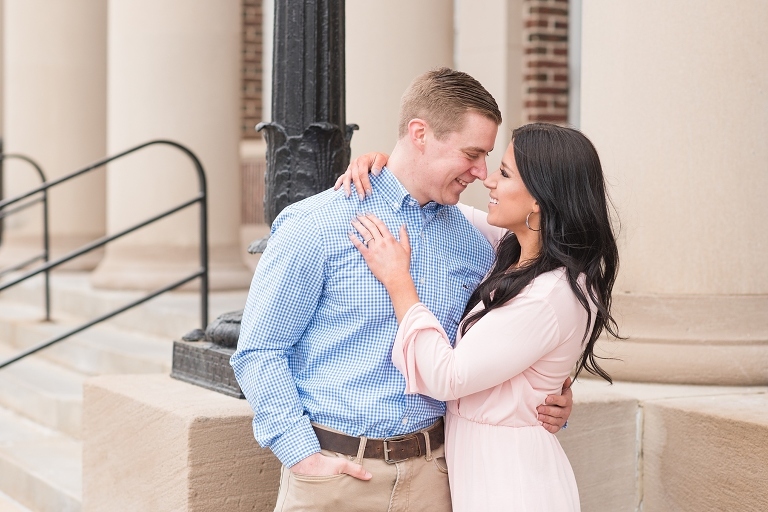 Brandon – I can’t wait for your wedding in June! 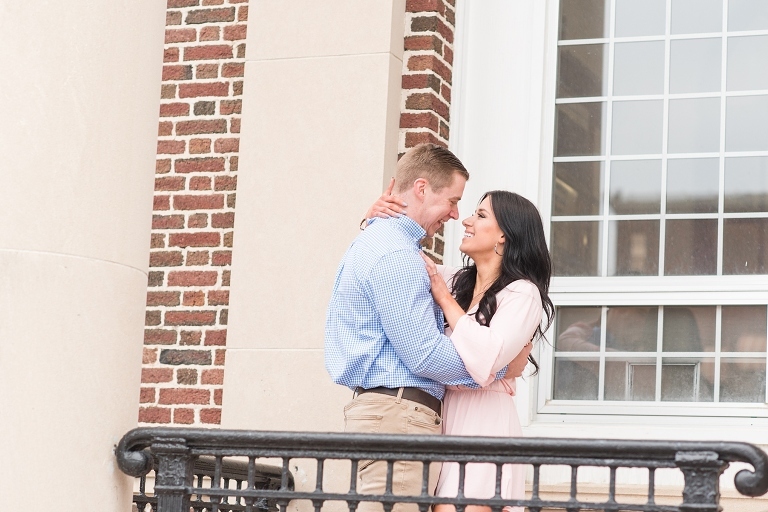 You’re a wonderful couple and your wedding day is going to be here before we know it! We started out in downtown Grinnell, at a location I’ve actually never used before – which is pretty surprising considering Grinnell isn’t exactly big. Thanks to a slightly cloudy and windy day, the post office was lit perfectly! A quick outfit change, and we headed over to a grassy area at Arbor Lake. Love these two – these are my favorites! Christina – you are stunning!